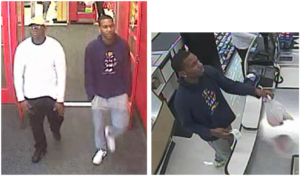 The Palm Beach County Sheriff’s Office is seeking the public’s assistance in identifying suspects wanted for Fraudulent Use of Stolen Credit cards. Unknown suspects used the victim’s credit cards and multiple Shell Gas Stations, Winn Dixie Supermarkets and Targets located in Greenacres, Boca Raton and Deerfield Beach. This incident occurred on May 30, 2018. ← The Palm Beach County Sheriff’s are investigating a crash involving a stolen ATM.